This is another Klamath game obtained in the same way as the "Owl's Net." Second: Bend each middle finger down toward you into the thumb loop, and bend each index down toward you on the near side of the near thumb string (Fig. 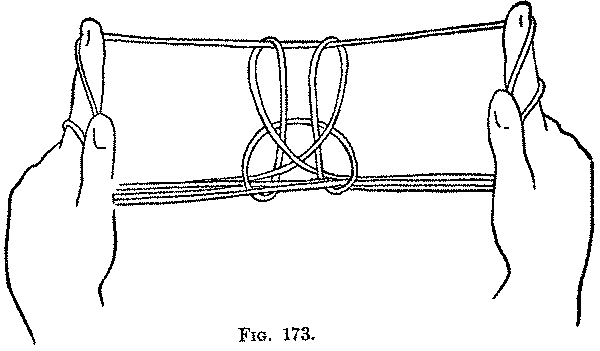 166, Left hand), then, holding this string tightly between these two fingers, straighten the fingers and turn the palms away from you to put the string around the tip of the index (Fig. 166, Right hand). Release the loops from the thumbs. Third: Pass each thumb from below into the little finger loop and draw toward you, on the back of the thumb, the near little finger far index string and both strings of the lower index loop (Fig. 167). Fourth: Pass each thumb up and away from you over the upper near index string, and pull this string down on the ball of the thumb, letting the other strings slip off the thumb (Fig. 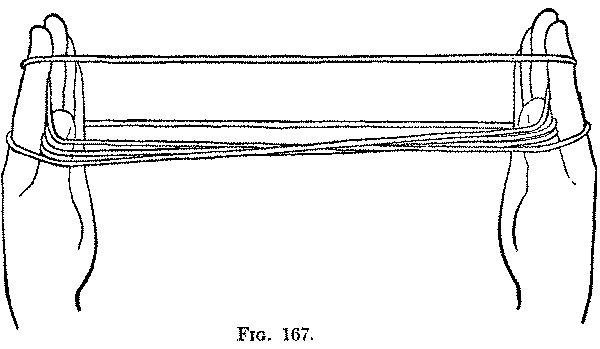 168). Turn the palms away from you and, still holding down the string with the thumbs, pass each thumb away from you under the far little finger string and draw this string toward you on the back of the thumb. 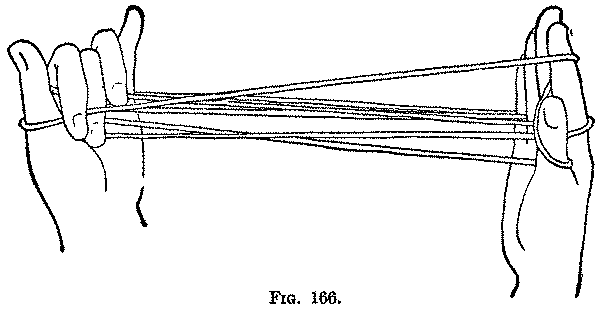 The string which was held down by the thumb, of course, is released during this movement (Fig. 169). Fifth: Insert each thumb from below (close to the index) into the small ring-like upper index loop (Fig. 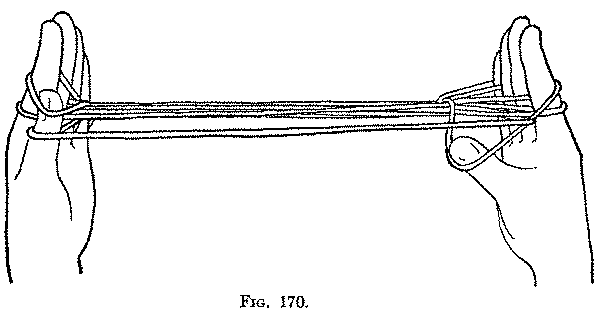 170, Left hand) and draw the upper near index string, on the back of the thumb, down through the thumb loop, this latter loop slipping off the thumb during the movement (Fig. 170, Right hand). 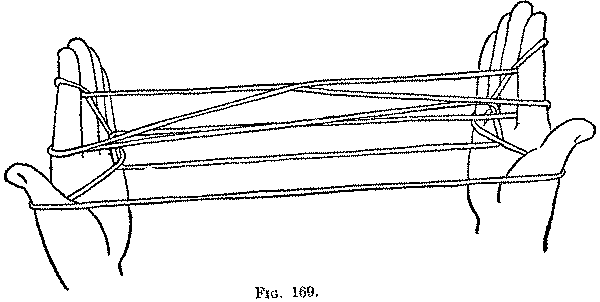 Sixth: Release the upper loop from each index (Fig. 171). Seventh: Pass the index, middle and ring fingers of each hand toward you and down into the thumb loop (Fig. 172); then gently release the loops from the little fingers, and put each little finger toward you in the loop with the ring, middle and index fingers. Hold all four fingers of each hand down on the palm; turn the hands with the palms facing each other. Lift up the near thumb string on the tip of each index, and withdraw the thumb. 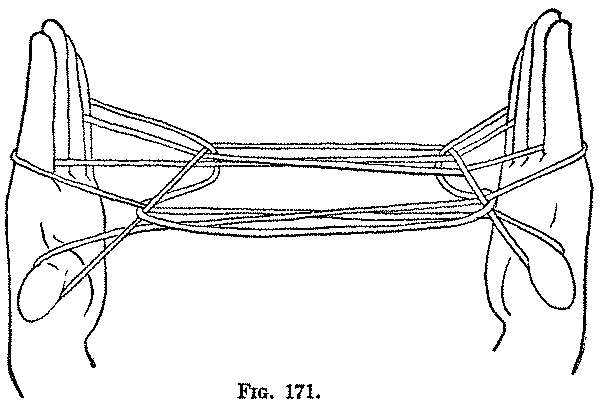 Some working of the strings is usually required to make the "Rabbit" appear (Fig. 173). This is an interesting figure because the majority of the movements are unusual, and are met with again only in the following figure.